Lopez Island is one of the larger islands in the San Juans, and is probably best known for biking (it’s relatively flat and has mostly patient residents) and local farming. We made use of both. We recently picked up a bike carrier for the Prius, and we hauled the bikes up with us. We did one major day of riding, but it was our longest ride yet: 32.4 miles by my reckoning, with a total climb of 2,340 feet (elevation graph to the left). We started out at about 9:30am, and did a few little pit stops throughout the island, checking out some of the parks/preserves with some periodic walks through the forest and to the beaches and a pit-stop for lunch. Overall, I think we probably spent a good 4 hours in the saddle of the bike. 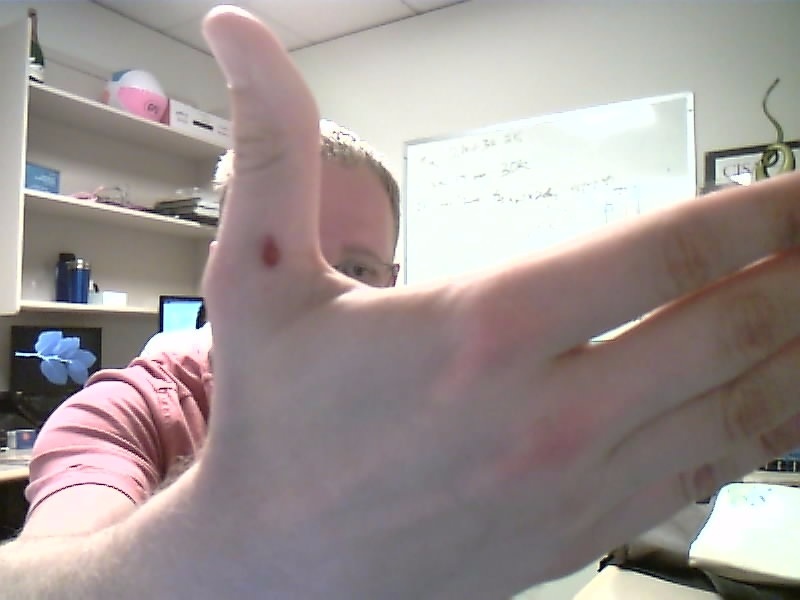 We also went on a ~4.5 mile sunset say kayaking trip, and I’ve got a monster blister to show for it. I should’ve worn my biking gloves. Somewhat graphic-ish photo to the right. :) I’d never been kayaking before, and it was really nice and relaxing. Less of a work-out than I anticipated, but I guess we were going slow considering it took us about 2 hours to make the 4.5 mile trip around the harbor. Other than that, it was mostly R&R. Ate some good food in town, and I’m pretty sure we either drove or biked on every road on the island. More pictures to come soon once I copy them off the cameras we toted along – I think I got some cool pics at the museum on the island. Oh – farming. On the way out of town, we stopped at Horse Drawn Farms. They mentioned they’re open all the time because they have a farmstand, and I had no idea what to expect. When we got there, there was a open building that had three deep freezers (one each for beef, pork, and lamb), and several refrigerated areas for produce. There was a weigh-scale, and everything was priced by the pound. It was up to you to calculate everything, add it all up, and deposit your money in the cashbox (and make change). Call my cynical, but I’m still shocked and amazed that an honor system like this still exists and seems to work! There was probably thousands of dollars of meats and produce, not to mention the well-stocked cashbox. Neat stuff. The last two meals we’ve made at home have featured foods we picked up here: flat iron steak and potatoes on Sunday, and Chile Rellenos last night. I’ve gotta say: farm fresh meats taste so much better than the same stuff from a grocery store.